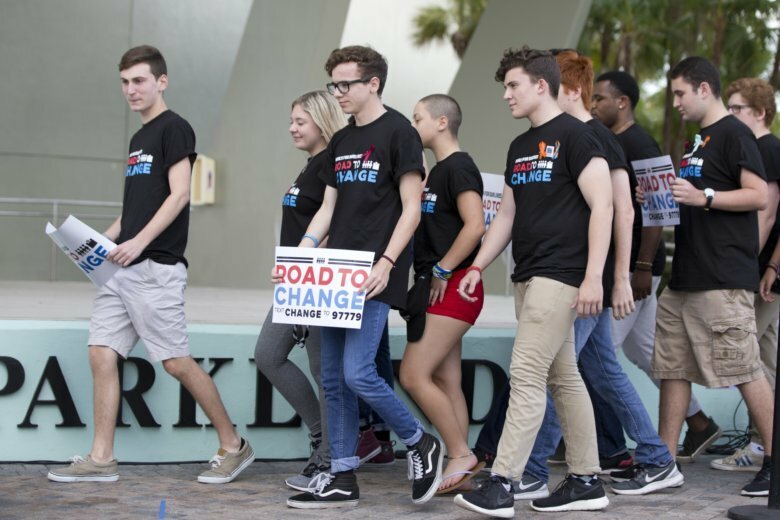 FORT LAUDERDALE, Fla. (AP) — The Parkland students who created an international movement to raise awareness for gun violence after a deadly school shooting were awarded the International Children’s Peace Prize on Tuesday. In the moments after 17 of their classmates and teachers were killed at Marjory Stoneman Douglas High School, David Hogg, Emma Gonzalez, Ryan Deitsch and Jaclyn Corin and more than a dozen others sprang to action, doing countless media interviews, grilling lawmakers about gun reform during town halls, and sparking massive walkouts and peaceful protests at schools across the country. Matt Deitsch, a Parkland alumnus whose two younger siblings were students at the time of the shooting, immediately left college to help form March For Our Lives. Hogg, Gonzalez, Corin and the Deitsch brothers were in South Africa to accept the award. “We are truly humbled and grateful for this award, but know that our work will not stop until we end the appalling and preventable epidemic of gun violence in the United States,” according to a statement released by March For Our Lives.